Another great figurine for the elephant collector. 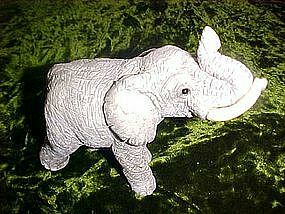 Made of a solid plaster material and is so detailed you'll think the elephants hide is real! Glass eyes too. Measures 4 1/2" tall and is about 5" long. The trunk is up for good luck.